In another display of soft power, China funds US$6 million for the restoration Ta Keo, a 10th century pyramid in the Angkor Archaeological Park. Work on the restoration of the deteriorating Ta Keo temple in the complex of Angkor Archaeological Park began on Saturday afternoon under the financial aid of China. “The restoration work will be taken eight years to complete ( 2011-2018) under the financial support of 40 million Yuan (about 6 million U.S. dollars) from the government of China,” Bun Narith, director general of Apsara Authority, which is in charge of management, protection and conservation of Angkor Archaeological park, said during the opening ceremony of the restoration work on Saturday. 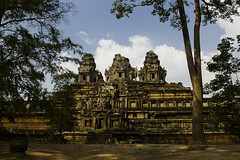 This is the second phase of Chinese government assistance for safeguarding, conserving and restoring Angkor activities after the first phase on the conservation and restoration of Chausay Tevada temple from 2000 and ended in December, 2008, costing 14 million Yuan (about 2 million U.S. dollars). “China is one of more than ten countries that has trained Cambodian archaeological experts, and helped financially and technically to conserve and restore ancient temples at Angkor archaeological park,” he said.